MCA awards which are decided by a panel of Merkur judges headed by Saul Rivkin. If you are interested in participating as a judge, please let us know. 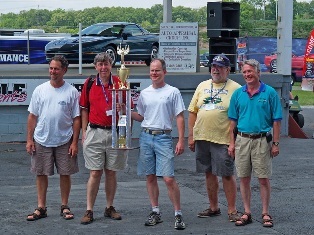 Carlisle Events awards a plaque for first, second and third places in each of the Merkur classes - there are classes broken down by models and years as well as for stock and modified vehicles. These winners are decided by all attendees on a ballot system. Everyone who attends Carlisle gets a voting form listing all the car classes. A lot of people don't realize they have this until they sit down in their hotel room on Saturday night and go through the 'goody bag' they got when they checked in at Gate 3. By then it's too late! Every car gets a sign, which must be displayed in the front window of all cars on the show field. On this sign is a unique entry number. Please do this as soon as you park your car in its designated spot. Attendees (exhibitors and the public) fill in their choice against each judging category. Carlisle Events tallies the votes and announces winners at 9am on Sunday morning. Please try and arrive between 9:00 - 9:30am. The Carlisle Award classes change from year to year depending on pre-registration numbers, but typically there are classes for stock and modified Scorpios and XR4Ti's. Make sure you fill in those ballot slips for your favorite Merkurs! There are no better judges than fellow Merkur owners. Only an owner knows how hard it is to keep all those little plastic clips etc. and maintain the cladding, seats and wheels in showroom stock condition. The MCA awards are handled in a different manner than the Carlisle awards and are focused as much on the people as the cars. Last year the MCA had award classes such as the Merkur Innovation Awards, the Merkur Preservation Awards, Best XR in Show, Best Scorpio in Show, Merkur Outstanding Engineering Award, Most enjoyed Merkur Award, Freundschaft entlang der strabe (aka Friends Along the Road) and more! New award classes may be added by the judging team as the occasion arises. Please remember, you need not to have a trailer queen restored Merkur to join in the fun! Bring any Merkur in any condition and have fun. If you wish to help in the judging process, please let us know. These awards will be judged by a panel of volunteer judges according to strict guidelines. The judging will take place on Saturday between 11 and 3pm, and the awards presented at the reception at the hotel on Saturday evening. Questions about judging & awards? Want to be a judge?